We enhanced tropical-flavor KOOL-AID Drink Mix with orange juice and diet lemon-lime soda to create this super-refreshing sipper. Place drink mix and sweetener in punch bowl. Add water; stir until drink mix is dissolved. Stir in orange juice. Stir in carbonated beverage just before serving. Pour over ice cubes in tall glasses. Be sure to use granularted no calorie sweetener, which measures cup-for-cup like sugar. Prepare as directed, using one of the following flavor options: Sparkling Orange Punch: Increase orange juice to 2 cups and substitute diet ginger ale for the lemon-lime beverage. Paradise Punch: Substitute 2 cups pineapple juice for the orange juice and club soda for the lemon-lime beverage. Omit sweetener. Prepare as directed, using KOOL-AID Sugar Free Tropical Punch Flavor Drink Mix. 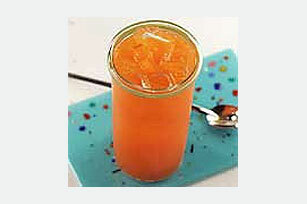 Prepare as directed, increasing orange juice to 2 cups and substituting diet ginger ale for the lemon-lime beverage. For extra flavor, use some of the punch to make ice cubes. Add to punch just before serving. Prepare as directed, doubling all ingredients. Makes 14 servings.